New | Soft Bound | 512 pp | Size 6 x 9 x 1.2"
Each year Harvard researchers estimate there are nearly 250,000 new Lyme disease infections--only10 percent of which will be accurately diagnosed. One of the largest factors in misdiagnosis of Lyme is the presence of other tick-borne infections, which mask or aggravate the symptoms of Lyme disease as well as complicate treatment. 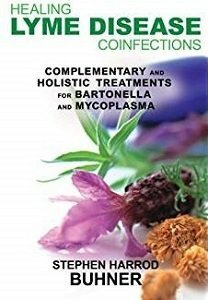 Two of the most common and damaging Lyme coinfections are bartonella and mycoplasma. Distilling hundreds of peer-reviewed journal articles on the latest scientific research on bartonella, mycoplasma, and Lyme disease, Stephen Buhner examines the complex synergy between these infections and reveals how these can go undiagnosed or resurface after antibiotic treatment. He explains how these coinfections create cytokine cascades in the body--essentially sending the immune system into an overblown, uncontrolled response in much the same way that rheumatoid arthritis or can can. Detailing effective, natural, holistic methods centered on herbs and supplements, such as the systemic antibacterial herb Sida acuta, which acts to protect blood cells from invading organisms, he reveals how to treat specific symptoms, interrupt the cytokine cascades, and bring the immune system back into balance as well as complement ongoing Lyme disease treatments.